Claziena, born in Heemskerk, Netherlands, emigrated to Nova Scotia with her husband Cornelus and nine children in April 1939 and they bought a dairy farm in the Annapolis valley. She was an accomplished baker, but her daughter Dora is even better says Dunnery about my mother-in-law. And I agree, she is the best baker I know. We recently convinced her to share one of her secret recipes with us for the joy of her grand-children. Of course, coming from a large family the recipe below will yield five dozen cookies, no less! 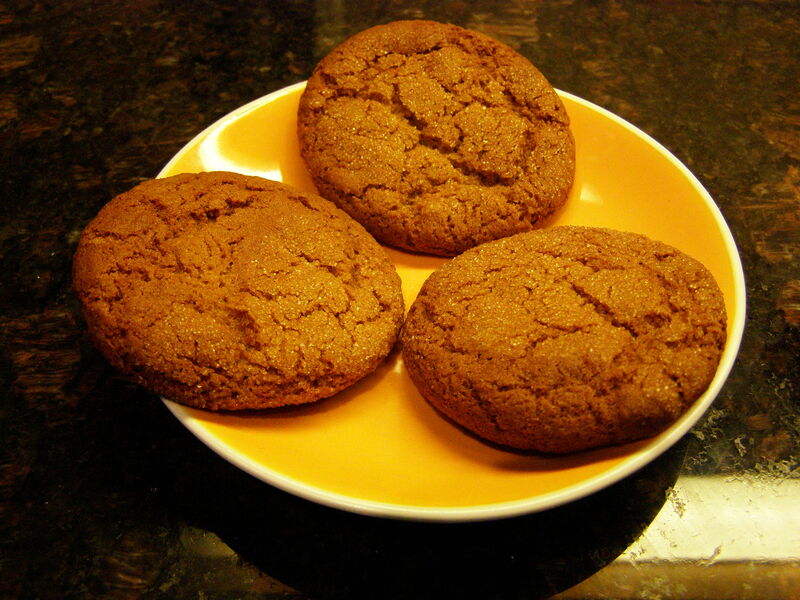 Mix 2 cups sugar with 1 cup butter, add 1/2 cup fancy molasses and two eggs beaten with a fork. Sift together 4 cups flour, 4 tsp baking soda, 2tsp ground ginger, 2 tsp cinnamon, 1/2 tsp salt. Combine the two and chill at least 30 minutes. Form small balls about the size of a walnut , dip into sugar and set on a baking sheet so they will flatten out with the sugar on top. Bake about 10 minutes at 375 or until nicely brown. This is the modified healthy version(Grand-Ma Dora’s). The original (Great Grand-Ma Claziena) called for one and half cup of shortening instead of butter, and an extra half cup of sugar. Also the balls were not to be flattened but dipped in water before being dipped in sugar making them more chewy and less crispy. Dora prefers the cookies her way, crispy with a bit more snap. Of course, all the children and grand-children prefer the original recipe from their Dutch Oma. My two cents worth: I made five batches trying round versus flatten, dip in water vs no dip, and the winner is : no dip, round shape. I had to turn my oven down to 350 on convection bake to get the nice golden brown in 10 minutes.I thought five dozen cookies was a lot. Actually, the above gave me a count of six dozen, short of one. Perfect for taking sailing, ginger is good to prevent sea-sickness. 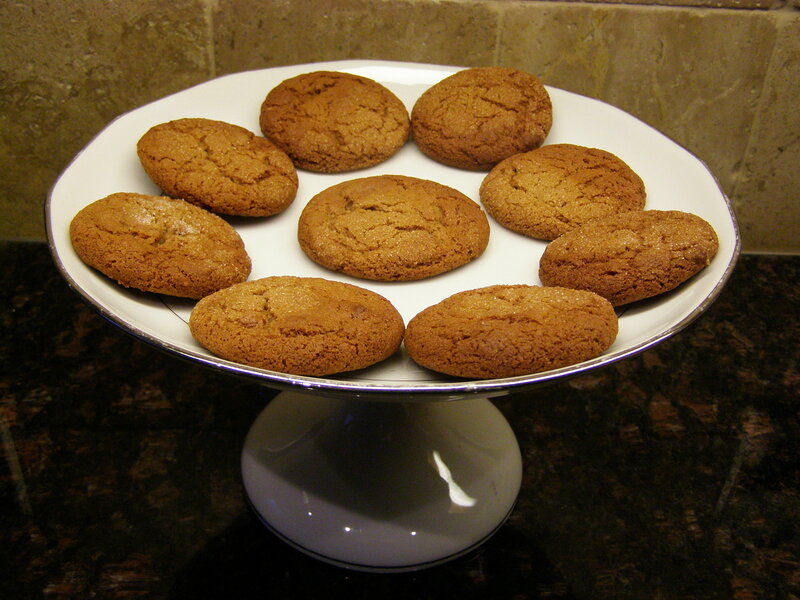 This entry was posted in Baking and tagged cookies, dutch cookies, food, ginger, ginger cookies, ginger snaps, recipe, recipes. Bookmark the permalink. These cookies are delicious and great for dunking in a nice cup of tea! Next time I make them I will add some candied ginger as well. Thanks. Candied Ginger sounds like a great thing to add! Those cookies look and sound ameoswe!!! Definitely look like something one might buy to go with their latte at a lovely coffee shop! Thanks for sharing! And btw, I would have no issues with you sharing lots of giant cookie recipes!!! Yum! I love reading these articles because they’re short but ifnoamrtive. I tried making these yesterday since we had some family to visit and I wanted to take along something sweet. Absolutely delicious! I made the chewy version (what I prefer in a cookie) and your directions were perfect. Thanks so much for sharing this recipe, I’ll be adding it to my all time favorite sweet tooth fixes! This is so excellent, I’ve been dreaming of this one!